We provide comprehensive care for foot and ankle conditions that include heel pain, fungal toenails, and stress fractures. Haro Podiatry & Laser Center offers an array of foot care services so you can live, walk, and play without foot pain. Haro Podiatry & Laser Center is a full-service New Jersey podiatry practice offering comprehensive treatment of foot and ankle problems. Any concerns and complaints you might have will be listened to, examined, and treated by our podiatrist – Dr. Ibrahim Haro. No matter if your condition has to do with skin, bones, nerves, or blood vessels in your lower limbs, we will evaluate the situation to arrive at an accurate diagnosis and then create a treatment plan to resolve it. Don’t think the problem is that big a deal? Well, at our practice no foot problem is considered too small to be tended or treated. Our many years of experience have taught us firsthand that minor issues can easily become major ones over time when they aren’t addressed. When patients visit either of our offices—Jersey City and Clifton—they can expect a short waiting time, a happy and friendly staff, and full attention and time given to their concerns. Whereas other doctors rush patients in and out the door like an assembly line, we always take the time to actually listen to you! For all our patients, we want your experience at Haro Podiatry Center to be informative and comfortable. For new patients, being well prepared for your first visit will help us provide the best service possible. You can easily find all the information you need—including downloadable forms—here on our website. Having these forms filled out before your appointment and then bringing them in will serve to make your first appointment with our practice an efficient one. Of course, if you have any questions before coming in to see us, feel free to give us a call at 973-755-7775. One of our team members will be happy to help you. Our mission is “to serve our patients by helping them walk, live, and play without foot pain.” We achieve this goal by paying close attention to our patients when they come in the office. You will find that Dr. Haro takes the time to actually listen to your concerns. We use state-of-the-art diagnostic tools to make an accurate, appropriate diagnosis and determine the root cause of the problem (so we can fix it for you). Once the problem has been identified, Dr. Haro will recommend the least invasive and most personalized treatment plan possible. Our practice was established in 2001, and has been in existence for 15 years. During this time, we have been able to help many people just like you overcome foot and ankle injuries and conditions. If you are suffering from a problem in your lower limb, come see and we do everything we can to help you walk, live and play without foot pain! 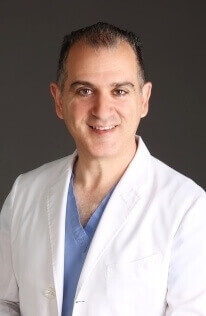 Dr. Ibrahim Haro earned his DPM (Doctor of Podiatric Medicine) degree from the New York College of Podiatric Medicine, trained at Long Beach Medical Center (NY) and Maimonides Medical Center (NY), and has been in practice since 2001. In addition to work done in his practice, Dr. Haro is also affiliated with St. Joseph’s Medical Center (NJ). He will listen with intent and take every concern you may have about your feet with the utmost seriousness and care. He will establish a treatment plan with you that is least invasive as possible and suits your lifestyle and needs. He will do everything he can to get you better as quickly as possible. Our practice was established in 2001, and has been in existence for 15 years. During this time, we have been fortunate to help countless patients overcome pain and difficulty in their lower limbs. If you are experiencing any problems in your feet or ankles, come see Dr. Haro and his team here at Haro Podiatry & Laser Center. Simply give us a call at 973-755-7775 and we will answer any questions you might and help you set up an appointment at either our Jersey City or Clifton podiatrist offices. Love coming in for my checkups. Dr. Haro is wonderful and always looking out for me. The girls are always courteous. I always leave smiling.Georgiane A. Now I can show my beautiful nails again without being embarrassed. Thank you Dr. Haro!Johanna M.
I came to Dr. Haro’s office to treat the fungus on my toes. I was treated with fungus and the results were great!Erwin F.
Newsletters: Stay up-to-date with our practice, Dr Ibrahim Haro, DPM, and even receive foot health tips with our latest newsletters! 1. He will listen with intent and take every concern you may have about your feet with utmost seriousness and care. 2. He will establish a treatment plan with the patient that is least invasive and that suits the lifestyle and needs of his patients. 3. And finally he will get them better as quickly as possible. Love coming in for my checkups. Dr. Haro is wonderful and always looking out for me. The girls are always courteous. I always leave smiling. Georgiane A. Now I can show my beautiful nails again without being embarrassed. Thank you Dr. Haro! Johanna M.
I came to Dr. Haro’s office to treat the fungus on my toes. I was treated with fungus and the results were great! Erwin F.
?Are sandals good or bad for my feet? ?Should I wear water shoes while swimming? ?Why do my feet hurt when I walk in my sandals? If you have a question concerning your foot and ankle health care, please call our office or fill out and submit the form below.